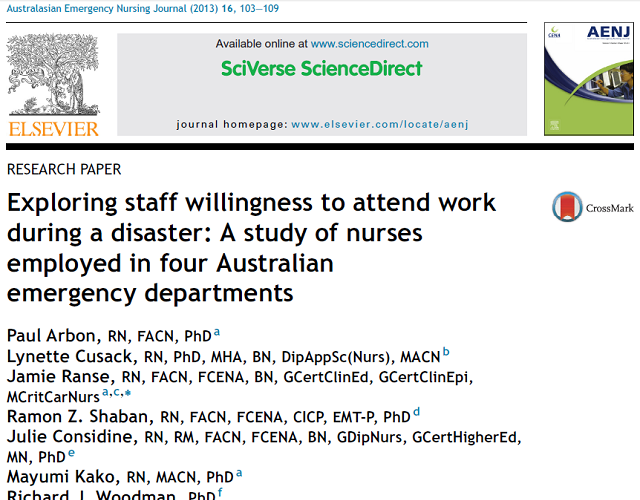 Background: Much of the literature about emergency nurses willingness to work during disasters has been from a non-Australian perspective. Despite the many recent disasters, little is known of Australian nurse’s willingness to participate in disaster response. 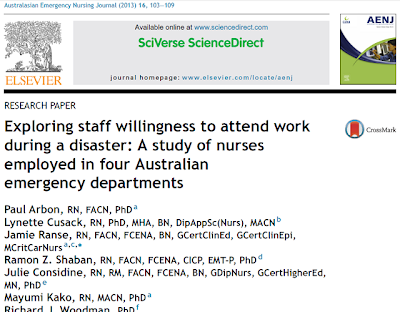 This paper presents ﬁndings from a study that explored nurses willingness to attend work during a disaster and the factors that inﬂuenced this decision. Methods: Data were collected consecutively using a combination of focus group and interview methods. Participants in this study, registered nurses from emergency departments, were recruited through convenience sampling from four hospitals in Australia. Participant narrative was electronically recorded, transcribed and thematically analysed. Results: The participants for both the focus groups and interviews compromised a mix of ages, genders and years of experience as emergency nurses from across four jurisdictions within Australia. Three major themes that inﬂuenced willingness emerged with a number of subthemes. Theme one reﬂected the uncertainty of the situation such as the type of disaster. The second theme surrounded the preparedness of the workplace, emergency nurse and colleagues, and the third theme considered personal and professional choice based on home and work circumstances and responsibilities. Conclusions: The decision to attend work or not during a disaster, includes a number of complex personal, work-related and professional factors that can change, depending on the type of disaster, preparedness of the work environment and the emergency nurses’ personal responsibilities at that time.